Now this is how a Discworld story should be. After the uninteresting Interesting Times, Terry Pratchett came right back with the much stronger Maskerade. The Lancre witches take center stage, and stage is just right because most of the novel takes place in and around Ankh-Morpork’s opera house. Well, two of the witches do, which is precisely the problem because their third turned into a Queen at the end of Lords and Ladies. The canonical beginning gets off to a rough start. Nanny Ogg sat down again. For all that Granny Esme Weatherwax prides herself on her abilities with headology (knowing what’s going on inside of one and acting accordingly), Nanny Ogg is also a shrewd practitioner of the art. She’s worried about Granny Weatherwax. Granny’s power has grown steadily, and witches whose abilities run unchecked tend to come to bad ends. Sometimes, of course, they didn’t go bad. They just went … somewhere. Granny’s intellect needed something to do. She did not take kindly to boredom. She’d take to her bed instead and send her mind out Borrowing, inside the head of some forest creature, listening with its ears, seeing with its eyes. That was all very well for general purposes, but she was too good at it. She could stay away longer than anyone Nanny Ogg had ever heard of. And so two witches need a third. The likeliest third, a young woman named Agnes, has other ideas. She has done what people who don’t quite fit into the small places they are from have done since time immemorial; namely, gotten herself to a much bigger place where she can find like-minded souls, or at least congenial company and reasonably gainful employment. Agnes presents herself at the Opera in Ankh-Morpork, just in time for an audition. Both her entrance and the audition itself are terrific pieces of comic business, with most of the action taking place in the gaps between Pratchett’s sentences. He sets things up, and the reader figures out what’s actually going on, which makes it even funnier. Further, he uses the slapstick to sketch out characteristics that will be important later in the book. It’s very economic exposition, deftly done. Agnes, who decides to take the stage name Perdita, meets a fellow junior member of the company. The girl who had spoken to her was slightly built, even by ordinary standards, and had gone to some pains to make herself look even thinner. She had long blond hair and the happy smile of someone who is aware that she is thin and has long blond hair. Christine didn’t appear to want to question this. Anything she found too difficult to understand, she ignored. With that, almost all of the elements are in place. But first, there is a brief discourse on the economics of writing and publishing. “You done a book,” said Granny. “You sent them some money to get it all printed?” she said. “Only a couple of dollars,” said Nanny. “Damn good job they made of it, too. And then they sent the money back afterwards, only they got it wrong and sent three dollars extra. Granny Weatherwax was grudgingly literate but keenly numerate. She assumed that anything written down was probably a lite, and that applied to numbers too. Numbers were used only by people who wanted to put one over on you. Her lips moved silently as she thought about numbers. Nanny Ogg poked her head around the sculler door. “Oh, yes. The money dint matter,” she said. “You’ve never been very good numbers, have you?” said Granny. Now she drew a circle around the final figure. “That’s good, ‘cos I reckon this Master Goatberger owes you a bit more than you got, if there’s any justice in the world,” said Granny. “I reckon, if there’s any justice, it’s about four or five thousand dollars,” said Granny quietly. There was a crash from the scullery. “Got it in a tin up the chimney,” said Nanny Ogg. Granny is, however, at a bit of a loss to explain the book’s popularity. What’s so special about this particular cookbook? “Er … Cinnamon and Marshmallow Fingers … page 17 …! Granny looked that up, too. Nanny Ogg, her face as red as her apples, seemed to give this some lengthy consideration. If she had anything to do with it, anyway. Granny is not the only with who can practice headology. With characters as good as these, Pratchett could dispense with plot and just depict the human comedy. Indeed, one of the book’s most affecting scenes is wholly independent of the rest of the story. It’s a card game between Death and Granny Weatherwax, and it’s an episode in the brief picaresque that takes the two witches from their natural environs to Ankh-Morpork. But plot there is. A new owner has taken possession of the opera house, and with it the Opera. While he is learning the ropes, others are coming unraveled and dropping sandbags on unsuspecting members of the company, or wrapping themselves around other members’ unprotected necks. The Ghost of the Opera, a hitherto benign spirit, seems intent on an early closing. The witches, having already encountered the guest tenor in the stage coach on the way to Ankh-Morpork and planning to look in on Agnes anyway (but not as busybodies) decide to investigate. Eventually the Watch is called in as well, discreet as only an undercover troll can be. The rest is a character-driven farce that shows that cosmic stakes are by no means necessary for readers to care about the fates of the people in the novel. Christine faints, Agnes sings, and the rest of the supporting cast reveals unexpected traits as they struggle to catch up with the Ghost before he can bring down the house. The magic in this fantasy tale is almost all theater magic, with just a little bit of witchery (as distinct from headology) thrown in to keep everyone on their toes. The ending, when it arrives, is both operatic and satisfying. 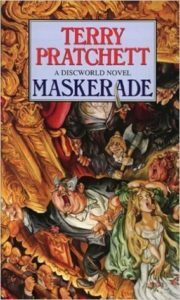 Like a great opera, Maskerade is a tale I want to enjoy again and again.